On September 5 President Trump rescinded BO's 2012 executive order that had authorized the protection from deportation of young adults who had been illegally brought to America as children by their parents – many, if not most, of whom had also entered or stayed in the country illegally. The program enforced under BO's executive order was known as the Deferred Action For Childhood Arrivals (DACA) & the recipients of this leniency had already been known as Dreamers ever since legislation known as the Dream Act (Development, Relief, & Education For Alien Minors) had been introduced in Congress in 2001 where it had stalled for eleven years when BO bypassed Congress replacing their function with his pen & phone. To apply for DACA, Dreamers had to have come to the U.S. before 2007, been under the age of 16 when they arrived, & younger than 31 when DACA was created in June 2012. They had to have a clean criminal record, be in high school, or have received a high school diploma or equivalent. As of September 5 no new DACA applications will be accepted under Trump's executive order. Accordingly, today DACA is not a program primarily for children, kids, or babies as the hostile anti-American media would have you believe. The average DACA recipient is 23 years old with the oldest being 36 – the majority are in their 20s & 30s. There are about 1.3 million people who meet the above DACA criteria but only about 800,000 of them have applied for DACA protection meaning that half a million people are outside the DACA program & will remain in immigration trouble no matter how this matter is resolved. Trump's termination of the DACA program, allows the 800,000 young unauthorized immigrant Dreamers who applied to DACA, & have a two year renewable permit, to continue to live & work in America without fear of deportation – but a phase out starts on March 5, 2018 unless Congress appropriately addresses the matter. The phase out means the program ends for different people @ different times but the last protection from deportation ends on March 5, 2020. DACA Dreamers whose two-year work permits expire between September 5, 2017 & March 5, 2018 had until October 5, 2017 to renew their permits – those who didn't are no longer protected by DACA. The expiring permits of about 150,000 DACA Dreamers fall into this first six month window & the initial estimate is that between 30,000 & 40,000 DACA permit holders did not renew on time. It is expected that the Department Of Homeland Security (DHS) will certify how many DACA Dreamers lost their permit protection by failing to renew by October 5. We will learn a lot about how serious this program is if 30,000 to 40,000 DACA recipients lost their protection in the first step of the process. There are no more renewal of permits after October 5 under Trump's executive order, unless it is revised to accommodate those who did not comply. 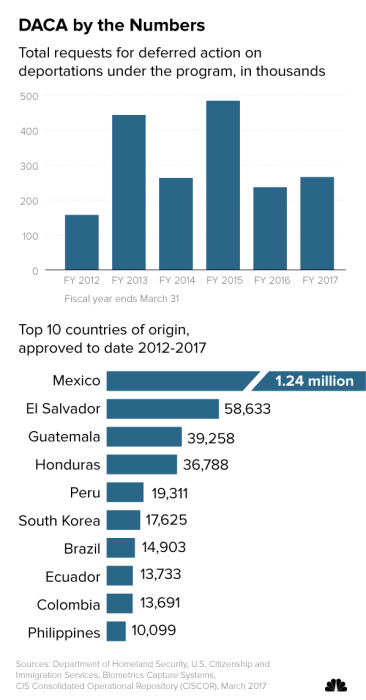 The following graphs provide a breakdown of requests for DACA protection by year & the top 10 countries of origin. The following graph from the Cato Institute gives an illustration of Cato's calculation of DACA renewals & projected expirations as described above. Source United States Citizen & Immigration Services (USCIS). Now Democrats want the DACA Dreamers legalized & Trump may very well too – but the above described predicament that DACA Dreamers find themselves in provides the framework for immigration negotiations. On Sunday October 8 Trump sent Congress a list of principles to be included in any legislation that would legalize DACA Dreamers. Highlights from Trump's list include 1) funding of the border wall, 2) punishing "sanctuary cities" & now presumably the sanctuary state of California, 3) mandating the use of E-Verify by employers to verify the legal status of prospective workers, 4) changing the issuance of green cards to a skilled-based system rather than a family-based system, & 5) detaining asylum seekers while their cases are being considered & making the process of applying for asylum in the U.S. more difficult in order to crack down on rampant fraud & avoid the gaming of the system as an easy means of illegal entry into the U.S. In the meantime DACA Dreamers have lost any sense of gratitude for people who have supported them from the beginning. Click here to see Pelosi shouted down (with Democrat Barbara Lee no help & silent right behind Pelosi) by a group of confrontational DACA Dreamers who are combative, aggressive, & belligerent toward her for her apparent willingness in September to work with Trump – what they want is not legalization for just the 800,000 DACA Dreamers like themselves but all 11-million illegal aliens in this country. Notice Pelosi is visibly shaken in the video. Click here to hear Pelosi talk about Dreamers once she regained her composure @ a later date. Hard to believe she is talking about the same people she walked out on after they shouted her down. So while the immigration negotiations get ready to begin between Congress & Trump with the goal of reaching a legislative solution before March 5 to @ least the DACA Dreamer situation described above the phase out of the deportation protection of DACA Dreamers will begin as approximated on the above Cato Institute graph. DACA beneficiaries will not move to the top of ICE (Immigration & Customs Enforcement) enforcement priorities after their work authorization permits expire solely because of the work permit expiration. Like any illegal immigrant DACA Dreamers with no work permit under BO's executive order will be subject to enforcement action if an ICE agent encounters them in the process of following their enforcement priorities that begins with convicted criminal aliens including raids targeting their parents who brought them here in the first place. But without DACA work protection rules in place Dreamers will be forced into the black market for jobs which raises their chances for removal when they work under the criminal activity of using a false name or borrowed identity. Long time readers of RTE know that I have always said that border walls, increased border enforcement, securing our borders or the like are not the first things to be done regarding illegal immigration. First, we must determine if we want the illegals here – are they beneficial or a hindrance to our continued prosperity. Certainly the way the DACA Dreamers treated Pelosi in the first video above shows they have developed an overbearing chip on their shoulders that wreaks of arrogance & entitlement meaning they look like more trouble than they are worth. DACA Dreamers had the inside track to winning American sympathies when they said "they were brought here through no fault of their own as children," & if they could have just kept showing both a sincere position of remorse & the least desire for atonement they would be much further ahead than petrifying Pelosi & Barbara Lee out of their wits. But they sure came here through somebodies' fault & that fault was their parents – people who were prepared to use their own children as pawns in anticipation of this moment when they hoped all family members tied to one illegal entry method or another would be able to stay in America. Frederic Bastiat (The Law – page 62) described this situation exactly, 167 years ago, when he said the law cannot have two missions; liberty & fraternity. The latter will destroy the former. If fraternity is legally enforced it will destroy liberty & trample justice under foot. The simple solution is to enforce the immigration laws that have been on the books for decades & Trump's executive order that phases out deportation protection for DACA Dreamers starting six months after issuance provides a more than fair way to resolve the matter both for the DACA Dreamers & their employers – both of whom took a chance that Hillary Clinton would be elected thereby continuing or expanding BO's executive order favoring not only DACA Dreamers but all illegal aliens. The Federation Of Americans for Immigration Reform (FAIR) reports that illegal aliens & their kids (including DACA Dreamers when they were kids) cost U.S. taxpayers $135 billion per year including higher & free education & medical & law enforcement costs – see graphs below. Click on graphs & images below to enlarge. These costs fall on state & local taxpayers by a 2:1 ratio ($89 billion state & local expenditures versus $46 billion federal expenditures). 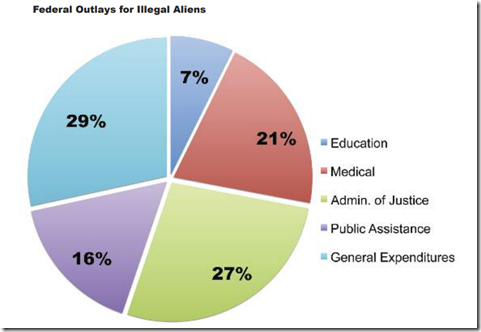 But the taxes paid by illegals go to the federal treasury by a factor of 5:1. And such tax payments being outweighed by benefits received by a 7:1 factor ($135 billion to $19 billion). 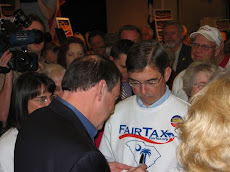 It is estimated that one third of illegals work in the underground or shadow economies & have no income or payroll taxes deducted from their wages – they pay only state sales taxes & the federal embedded taxes that are inherent in every purchase of goods or services made; here is where the implementation of the FairTax would cut tax evasion significantly. An argument can also be made that the FAIR report overstates the taxes received from illegal aliens – wouldn't the taxes have been paid if legal workers had been the ones employed? 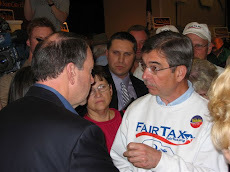 – in which case the wages would have been higher thereby meaning more than $19 billion in taxes would have been paid. It has always been a problem for me to want to welcome people who sneak into America @ midnight in the trunk of a car – not a good foundation to build a new life on. BO's DACA executive order also has a foundation built on quicksand in that immigration is the responsibility of Congress not the President – see the Naturalization clause of the Constitution, Article I, Section 8, Clause 4. "Few powers are more fundamental to (a nation's) sovereignty than the control over immigration & the vesting of citizenship in aliens (naturalization)". – The Heritage Guide To The Constitution. Of course this is why immigration, right after making people totally dependent on government – both financially through taxes & physically through universal healthcare, was BO's highest priority in undermining & trying to destroy America's sovereignty. During the Constitutional Convention James Madison preferred "to invite foreigners of merit & republican principles among us." 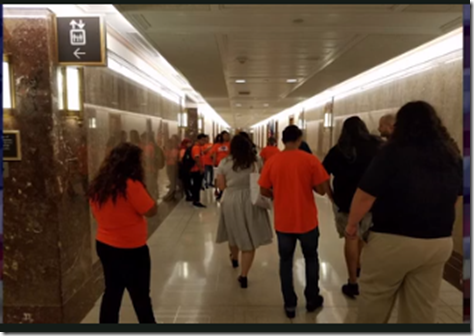 Madison was not referring to illegal aliens whether they came here through no fault of their own or any other means – they had to be invited & vested through the naturalization process that concluded by taking an oath to support the Constitution which is a far cry from the DACA Dreamers who chanted "here to stay" in front of the Capitol last month & then stormed the Dirksen Senate office building looking to protest Trump's executive order in specific senators offices. See image below. But properly handling illegal immigration is just part of the politically correct poison threatening to ruin America that Trump was elected to remedy. In addition to illegal immigration as described above America is in danger of not knowing right from wrong regarding Black Lives Matters, Antifa, homosexual rights, attacks & distortions by the hostile anti-American media on the First & Second Amendments, the fallacious destructive anchor baby claim to birthright citizenship, settling the incompatible relationship of Muslims who follow Sharia law taking a U.S. citizenship oath, banning people from Muslim countries where terrorism thrives from entering America until we know that immigrants & refugees from these countries are not terrorists, ending sanctuary cities & California's sanctuary state policy, & restoring the enforcement of the nation's immigration laws. The urgency of settling the above list of politically correct matters & reversing the mindset that allowed them to come forth in the first place is far greater than settling issues like tax reform, healthcare, climate change, the national debt, the budget deficit, or even adequate national defense. In short, we have to start by ending DACA per Trump's executive order while simultaneously ridding ourselves of the other politically correct menaces jeopardizing our futures because we simply cannot afford not to. Immigrants made large contributions (not money) to U.S. Some names are Einstein, Sergey Brin. co-founder Google, Joseph Pulitzer, Rupert Murdoch, Levi Strauss. These were the types of people James Madison was referring to in the post - none of them are DACA Dreamers. God bless you for ALL that info and research! You need to step out of your intellectual bubble. I know DACA kids because they are the same age as my children and went to Somerville high school together. You view One you tube video of a bad meeting with Nancy Pelosi and you use it to prove how "ungrateful" a million young people are. You should be more careful. Your position is extreme. Extreme is not enforcing immigration laws to the point where the US had arguably the world's most lax and dangerous immigration policy under BO. Extreme is creating sanctuary cities and states in direct violation of immigration laws. This has lead to numerous crimes and killings by illegal immigrant criminals, many of which return after being arrested for crimes, or not punished at all for crimes per elite Left judges. Extreme is allowing or not even checking whether immigrants desire to become part of traditional American culture. Extreme is allowing most dangerous illegals such as those touting Sharia law entry to the US. Most of these yearn to kill Christians, Jews, gays, even anyone who does not follow their narrow ideology of hate. Extreme is not learning of the stupidity of numerous European countries lax immigration policies that now render them to frequent terror. Extreme is allowing haters of traditional American culture access to billions of tax payer paid welfare to illegals, significantly increasing Federal, state, local debt to the point where, unchecked, a US dollar collapse is imminent. Extreme are elite Left politicians faking that they support immigrants when the only reason they allow them into sanctuary cities is to push for citizenship and / or increasing voter fraud, thus increasing their odds of winning elections. These liars also are fierce opponents of voter ID. Extreme are elite Left that hate traditional American culture, the constitution, free market capitalism, freedom of speech. These Marxists hide their true intent. And what is their true intent? To weaken America and thus remake America into a Marxist Maoist state where they control most aspects of economic and personal freedoms. Extreme will be our fate if we do not notice what is at stake - greatest challenge to our freedoms since King George 3rd. What immigration policy would you suggest for the United States? 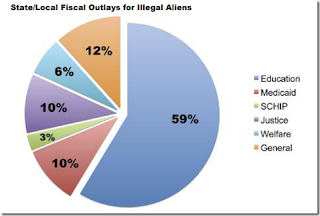 The $135 billion per year of taxpayer $ supporting illegals is approx 7/10 of 1% of GDP but about whopping 33% of our GDP annual growth rate of approx 2%. I doubt there is a positive ROI for our taxpayer support. Nix this $135 billion, allow it to pay down our huge $20 Trillion total Gov debt. This will improve our finances and drive our GDP to a 3% to 4% GDP growth rate we are capable of. Paul Harvey - "If I Were The Devil"